Last updated December 1, 2016 at 4:23 UTC. I’m currently trying to improve my completion rate. I use the “Won’t Play” category as “Won’t Play Yet” instead of “Won’t Play Ever”. Continuing my challenge to beat / complete at least 5 games each month this year, March was another success! I don’t count DLCs as an addition to the backlog, so that’s why the backlogged count for this month is 2, as I already owned Hitman. Continuing my challenge to beat / complete at least 5 games each month this year, February was another success! 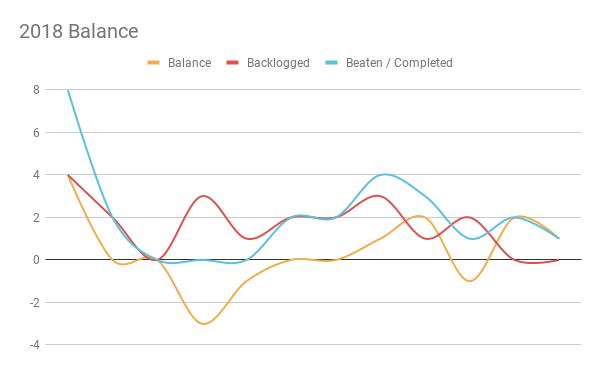 In terms of the backlog, unfortunately my balance was 0 this month, since previously beaten games that were completed do not count for that score. At least 5 games must be beaten / completed every month. I cannot compensate between months e.g. beat 4 games in January and 6 games in February. The games must be beaten / completed between 00:00 BRT of the first day of the month and 23:59 BRT of the last day of the month. If I beat a game even 1 minute earlier / later, it doesn’t count. Previously beaten games can be completed for the challenge. For example, if I got 90% of achievements in a game before and 100%’ed it in the current month, then it counts for the challenge in that month. Upon failure in a month, no games can be added to the backlog in the following month, and a maximum of 2 games are allowed per month for the rest of the year. 2018 wasn’t too bad. I managed to keep the number of backlog additions to an all-time low, which I’m very proud of. I hope I’ll continue that trend in 2019. I beat the Whistleblower DLC for Outlast this month (that was brutal! ), and I’m currently trying to 100% the game (although this won’t count as a backlog reduction because it was previously beaten). The only achievements I’m missing are the ones to complete the base game and the DLC in insane mode. Unfortunately, I died on my first try for the DLC while being chased by Gluskin, because I got lost. But that’s almost at the end of the DLC, so I think I can get it in my second try. I’m trying the DLC first because the base game is a lot harder in insane mode. I’ll also try to beat Transistor for the monthly theme in the few days we have left this month. Just wanted to let you guys know that there is a new Enhanced BLAEO update, because you’ll probably have to update manually (click here). From v3.1.0 up, updates should be automatic. Hello, everyone, it’s been a while since I’ve been here (I used to go by revilheart). I finally decided to update my script for this website (previously known as rhBLAEO) and added a cool feature that allows you to generate posts (I know about https://kubikill.github.io/blaeogenerators/, but I feel like a script that integrates this functionality into the website itself is a lot more practical). Happy backlog killing for all! Hello, assassins! I’m alive! Wow, it’s been 6 months since my last report. But I’m here now and I’ll try to be more active. These past 6 months I’ve implemented a userscript for SG (you might have heard of it - ESGST), so having to maintain it is quite time consuming and I find myself with less and less time for games. As you can see below, some pretty disappointing results, but let’s see if this month turns things around. No idea, the achievements are hidden (please don’t spoil them, I’d like to discover them on my own). The other achievements are hidden (please don’t spoil them, I’d like to discover them on my own). What was missing to 100%? A few silver and gold medals. Games that were both added and removed in a month are not included in that month’s count. My score for each month is the sum of games beaten and completed that month, and The Backlog’s score is the sum of games added that month (including the ones both added and removed). The Backlog was brutally assassinated this month! revilheart was brutally assassinated this month! revilheart and The Backlog tied this month! revilheart was assassinated this month! Games that were both added and removed this month are not included in this count. My score is the sum of games beaten and completed this month, and The Backlog’s score is the sum of games added this month (including the ones both added and removed). Hello assassins! I’m still going strong with my challenge: I didn’t enter a single giveaway this month and only added one game to my backlog (Chaos On Deponia) because I needed it to play the sequel, so it was both added and removed. Let’s go for a third month! You can join in too, although nobody ever does. :P If you missed my previous posts, my challenge is not to add a single game to your library during a certain month, unless Steam automatically adds it (for example, when Steam added the special edition of Skyrim for everyone who already owned the game) or you absolutely need to (like I did this month). I finally did what I said I would and played the Metro games this month. For the most part I went back to a few games I had unfinished / beaten and tried to beat / complete them to improve my completion rate. The layout I started using last month got through some changes: I moved all my game notes to Steam in the form of reviews (if you’re my friend, you must have seen my flood of reviews on your activity feed), especially because it’s NaNoWriMo, so from now on I’ll simply link to the reviews. That keeps my reports a bit cleaner. And my profile revamp is almost done: I already changed all my posts to the new layout, but I still need to edit some things here and there. I also improved my profile a bit by adding a chart and some useful information about my perfectionist journey, although it’s not entirely complete yet either, so I’ll edit everything by the end of next month. I hope everyone else had victory against their backlog this month and let’s keep fighting The Backlog! This one has been removed from the Steam Store, so I can’t leave a review there. I loved it, it’s a great sequel. According to 4A Games, any humans in the levels The Chase, Red Square and D6 do not count towards the achievement for beating the game without killing any humans unless forced to, so you can kill them all you want according to them, but I didn’t kill a single human outside of those levels and still didn’t get the achievement. Well, I did kill the humans in the dream sequence, but it was a dream sequence, nobody was being killed for real. Other than that, I knocked everybody out instead of killing them, so I used a “fix” from a guide to get the achievement. Beat the game in under 3 hours / without dying / without using any ability points. A-rank and S-rank all levels in all modes. Beating the game on the hardest difficulty / without killing anyone / without setting off any alarms. Beating the game without dying (with both Clive and the duck). Getting the no damage bonus in each stage (with both Clive and the duck). Getting a ★ clear time on every stage (with both Clive and the duck). Playing the game for 40 hours. 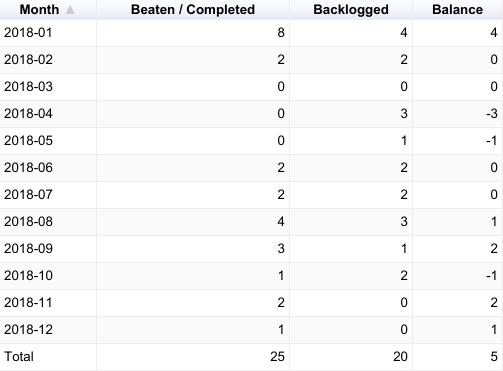 The Backlog was assassinated this month! My last SteamGifts win was on September 22 and I haven’t entered a single giveaway since then. I’m so happy with the results that I’ll continue this challenge next month. It’s finally starting to feel like there’s an end to this backlog. Are you with me this time? A body (in an awkward position). It has more than two eyes. Also, new layout incoming! I love it so much that I’ll go back to change all my previous posts to this layout. By the way, would anyone be interested in helping me get some Left 4 Dead 2 achievements next month? I played a bit with Adelion and tso184 during the weekend and was able to get some, but I’m still missing a lot.